Ames, Iowa (CNN) - The owner of an Iowa construction company where Mitt Romney will deliver a speech on the economy received stimulus funds, according to the government's web site that tracks expenditures from the federal program. Kevin Kinzler, owner of Kinzler Construction Services, received a $1.25 million dollar loan from the Small Business Administration through the American Recovery and Reinvestment Act in May of 2009, shortly after the stimulus plan was signed into law by President Obama. The Recovery.Gov web site describes the loan as being designed "to aid small businesses which are unable to obtain financing in the private credit marketplace." In addition to the small business loan, Kinzler Construction Services also received nearly $650,000 in stimulus funds through grants provided by the Department of Energy. The grants were first reported by the left leaning blog, Think Progress. Romney has made the plight of small businesses a key line of attack on Obama in the final weeks of his campaign. "I want to make sure that we champion small business, we help small business grow and thrive," Romney said on Thursday in Cincinnati before embarking on a bus tour across the battleground state of Ohio. The GOP nominee has also repeatedly labeled the stimulus program a failure and accused the president of basing his second term agenda around passing another round of Recovery-type funds. "The president has the same old answers as in the past – he wants another stimulus, he wants more government workers, and he wants to raise taxes," Romney said at one Ohio stop. In excerpts of Friday's speech on the economy in Ames released by his campaign aides, Romney is again expected to tweak the president's program. "A new stimulus, three years after the recession officially ended, may spare government, but it will not stimulate the private sector any better than did the stimulus of four years ago," says one speech excerpt. Eric Fehrnstrom, a senior campaign adviser, says Romney's speech will lay out why this is a "change" election. "This election is about big things: education of our children, choices in our healthcare, whether we have jobs, the strength of our military, our dependence on foreign oil and America's place in the world," Fehrnstrom said. "There are big choices facing the American electorate as they think about the election. Do they want real change or not?" I had a neighbor that is excecutive for GM. His job was saved by Obama and he is still going to vote Romney. Amzing how far greed and ignorance will go! Wrong photo ! He spoke outside in Ames today. Obama's method, of throwing money at a problem, has been dismal, in improving this economy. It takes more than money, to solve these problems. Of course, throw more money at the rich: that solves everything. While we're at it, throw good paying jobs in China's direction, and give everyone a job at Staples for $9 an hour. Romney raised fees on everything that moved in MA, and cut taxes only for the wealthy: the result was local taxes increased at the fastest rate of anywhere in the country, driving out small businesses, and a labor shortage was created. He can't manage the MA economy, what makes you think he will improve life for anyone in the middle class, the people who will pay for his tax cuts. Has anyone seen the Medicare e-mail from BC,BS in Ala?? ALL LIES!! Curious as to why Lyin Ryan would be there today. Romney & Ryan are the biggest liars that ever lived. Someone needs to give Mitt a list of companies that have in some way benefited from government funds. He just keeps using the hypocrites who have taken money from the government whether by loans or contracts but cry out against that same government. And despite this hypocrisy, I am glad this company is still open today. I swear, Romney's team just doesn't pay attention. They are worse than McCain's team. 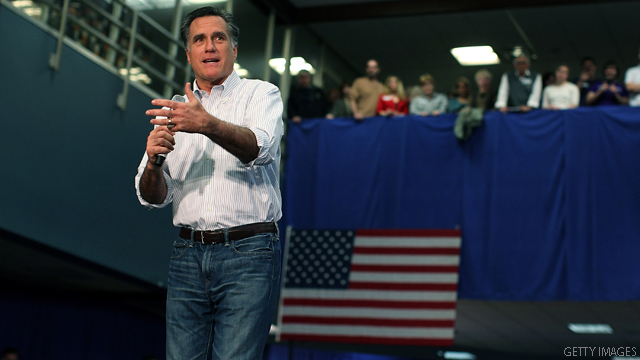 This is the second time Romney has campaigned at a company that received stimulus funds. Heck, the convention was in a location paid for by tax payers. How republicans can look at these fools as competent is beyond me.